The biggest criticism labeled at today’s most successful thriller writers is how long their books are. Most critics, and readers, are well aware that today’s writers are coerced by the publishers to deliver big, fat books to help justify the $8 to $10 price tag they then affix these mass market paperbacks. So, because of economic reasons, we readers have to dig through pages and pages of padding not vital to the actual plot of these action orientated pot-boilers. Which is why discovering Australian writer Matthew Reilly was like a breath of fresh. 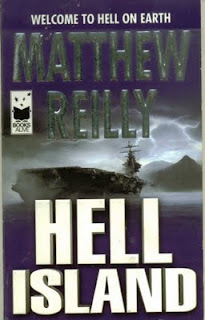 Reilly’s writing is totally reminiscent of the best of the old pulp scribes. His books are short, lean and simply the purest form of pulp writing on the market today. He doesn’t waste a single sentence, let alone a page, on telling us the characters’ thoughts, emotions, backgrounds or anything else for that matter that stands in the way of the action. Reading his stuff is like eating the leanest hamburger you’ve ever had. It’s not steak by any means, but it’s damn good regardless. In HELL HOUND, a government weapons experiment on a secret island in the South Pacific has gone horribly awry. When the aircraft carrier Nimitz goes to investigate, it suddenly goes off the Pentagon’s radar, along with the six hundred marines on board. The military quickly sends in four crack recon teams made up of various units from Seals to Airborne Rangers to discover what has happened on Hell Island. The second these squads arrive, they are attacked by a horror beyond imagination and soon are battling for their lives. The Marine team is lead by Captain named Shane Schofield, nicknamed the Scarecrow. He's the toughest badass in the world and he’s not about to go down without a fight, no matter how overwhelming the odds against him and his team. At 108 pages, this is a book you will most likely devour in one sitting. Then again, once you’ve begun, I dare you to put it down. In Australia these are called Short Novels, and if most of them are as much fun as this one, it’s a format I wish American publishers would consider adopting. There’s no padding in HELL ISLAND. Only action, 108 pages of it. That should be cause of enough for you to find a copy. Amazon and other major book distributors handle it, and other Reilly titles. Then buckle up for a real thrill ride. Harper Blaine is a Seattle based private eye. She is murdered and then resuscitated, i.e. brought back from the land of the dead. But upon reawakening to the world of the living, Blaine discovers her death-experience has left her with the unique ability to walk through the grey realities that exist between life and death, ergo she has become a Greywalker. From that point on, her life is never the same and she soon begins encountering all kinds of devilish creatures both among the dead and the living, ala zombies, vampires and other assorted monsters. Who ever thought Seattle could be such a ghoulish center of activity. Honestly, this series is simply a terrific, well envisioned saga that moves from novel to novel with a growing essence of urgency surrounding Blaine and the people who inhabit her strange world. Perhaps it is the book’s one and only flaw that it is an integral part of a series and if you haven’t picked up the first three, you might find yourself in over your head. Understandable. On the other hand there is so much to relish and savor in this book, you just might want to go out and find those other three. 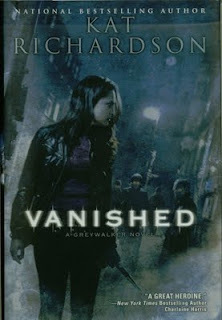 VANISHED opens with Blaine being confronted with ghostly apparitions warning her about her past and the secrets held by her deceased father. She’s soon on a plane winging her way to Los Angeles to visit her mother and begin the process of unraveling both her father’s death and the true origins of her own abilities. Somehow the two are tied together in a twisted, complex mystery and her trip only confirms without providing any substantial answers. Just when she’s reached the end of her limited clues, Blaine is summoned back to Seattle by Edward Kammerling, the head of the city’s vampire colony. Although they are old allies from previous adventures, Blaine doesn’t trust the businessman bloodsucker and is wary of his demands. Kammerling confesses that his financial holdings in London are being threatened by unknown forces and that his vampiric agent there has disappeared without a trace. Leary of sending one of his own kind, who would be recognized immediately, the crafty vampire wants Blaine to take on the assignment. It is a request she would have easily declined days earlier, but on the flight back home, Blaine experienced a horrifying dream wherein her old boyfriend, Will Novak, is in mortal danger by demonic forces. Will currently resides in London with his younger brother. Not believing in coincidences, when Kammerling explains his troubles and puts forth his offer, Blaine is convinced she has to go to London if only to find Novak and make sure he is safe. Of course the dream is prophetic and by the time Blaine sets foot on British soil, all hell breaks lose and the action kicks into high gear and never once lets up. Richardson’s work is always straightforward, like a razor blade slash, clean and deadly. She creates amazing situations, forever putting Blaine through one harrowing challenge after another, yet controlling the plot with a truly deft imagination. From water born demons to a blind old Greywalker and a fiendish super-vampire whipped up by a Jewish sorcerer, VANISHED packs more action in one book than do many others in five. It’s a roller-coaster ride that will have you cheering and turning pages until your fingertips have blisters. And the bloody prize at the end is the book is just a prelude for lots more to come in the life of Harper Blaine, Greywalker. I’m signing on now. You should too. 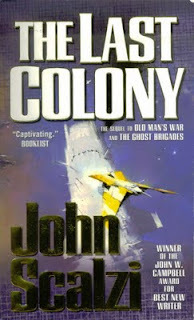 Here we have the third in John Scalzi’s Colonial Union series begun with OLD MAN’S WAR and followed by THE GHOST BRIGADES. Taking up the mantle of Robert Heinlein in dealing with mankind’s future and the roles the military and politics will play is the core of this series. In the far future, man has finally gone to the stars and learned that we are not alone in the universe. Some alien races are friendly and others are not. It is the latter the Colonial Union, the administrative body that controls colonization, learns to keep at bay with their Navy & Marines called the Colonial Defense Forces. In OLD MAN’S WAR we first met John Perry, a seventy year old Earthman who volunteered to join the CDF in exchange for longevity via a newly manufactured synthetic warrior’s body. The deal was if he put his new body on the front lines for five year and survived, then he would be rewarded with a cloned, more human body and allowed to live the remainder of his days on one of the Union’s far-flung colonies. Whereas the sequel, THE GHOST BRIGADE, continued to the focus on the military, in particular the Special Forces group of which Jane Sagan was an officer, this third chapter takes us to Perry’s promised new life. As the book opens, John, his wife Jane and their adopted daughter, Zoe, are all living peacefully and contentedly on such a colony planet. Much to their surprise, one day they are visited by John’s former military commander, a Marine General named Rybicki, with a very special request. The Colonial Union is about to start the first ever second generation colony made up of representative groups from ten established colonies. Rybicki convinces them that this amalgamated new colony is the wave of the future and requires their special skills, both as administrators and former military to make it succeed. He plays on their strong sense of loyalty and both agree to leave their home and become the leaders of the new Roanoke colony. Once they, and twenty-five hundred colonists, arrive at their new world, they immediately learn just how much they have been duped. Not only is the planet they have come to not the one they were intended for, but it is revealed to them that they are about to become pawns in a new cosmic conflict that threatens the Colonial Union. Over the past decade, unbeknown to the average citizen, a group of aliens under a visionary named General Gau, have formed an alliance called the Conclave with the solitary goal of control all future expansion in the universe. Once established, the Conclave declares itself the only authority on colonization and no new colonies, from any race, will be permitted without their approval, including those of the human race. Bristling at this imposed alien threat, the Colonial Union responds by openly defying the Conclave with the establishment of the Roanoke Colony. But to guarantee its safety, it uses subterfuge and keeps the exact location of the colony hidden from the Conclave. Once Perry and the other colonists learn they’ve been put into a potential new apocalyptic struggle, things start to go to hell fast. John and Jane find themselves trying to make the colony work while at the same time learn if the Colonial Union’s schemes and strategies don’t have further implications for their very survival. Scalzi’s pacing is first rate and the surprises keep coming, one after another until the true purpose of THE LAST COLONY become horribly clear to our characters. All the while he weaves a skillful story about likeable people caught up in a situation that will test their loyalty, character and eventual love for one another. It’s powerful stuff and it is played out without skipping a beat. There are timeless questions about what rights does any government have to control the destiny of its citizens on the basis of doing what is right for them. Is it really government by the people, or government by the bureaucrats? Action, adventure, alien races, philosophical debates and a very polished narration. What more could you want from a science fiction novel? Scalzi is clearly one of the best writers of the genre working today. THE LAST COLONY is just more proof of that fact. If you are an avid reader and also love movies, the novelization of a movie script into a book is like having two deserts served up on one platter. Max Allan Collins is no rookie when it comes to adapting movie screenplays, he did Saving Private Ryan, Airforce One and American Gangster. 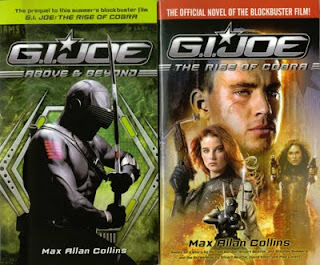 When approached at the San Diego Comic Con last year to turn the script of this summer’s latest toy to mega-hit blockbuster, G.I.JOE, into a paperback novel, Collins opted to up the ante and deliver not one, but two books to aid the cause. It was an extremely wise idea on his part, as I’ll explain. Films, like books, are generally told in three acts, the opening, the middle and the climax. The opening is used to introduce the characters and supporting players. Once established, the story evolves to the middle, where heroes battle villains or whatever obstacles might exist to thwart the protagonist. All of which culminates in the third act, the major confrontation and its resolution, leading to a fade out or simply the words; the end. The Achilles heel of an action adventure movie is that it cheats on the opening. Hollywood producers today are anxious to get to the fights and battles and with each new film we are given less and less information on the background and motivation of the characters. Thus we end up with two dimensional characters going through the motions. Hardly engaging or demanding of our time and attention. Collins may never publicly admit it, but this sacrificing of the opening act is one of the major flaws of the movie script for G.I. JOE – The Rise of Cobra. Throughout the book the people who dreamed up the story strategically placed several truncated flashbacks intended to make up for that flaw. Sadly they are so brief that they only pose more questions than they answer. Collins somehow convinced the studio people to allow him to take these skeletal flashbacks and from them build an entire body of prose which would become a proper prequel, clearly defining all the characters and also adding weight to the crucial mysteries that are revealed at the end of The Rise of Cobra. The result of that request was G.I.JOE – Above & Beyond, a book that takes it time introducing us to Duke Hauser, Ripcord Weems, General Hawk and all the terrific Joes who make up this special, international strike force established by the U.N. to take on only the most critical assignments. In Above & Beyond we learn how Duke and Ripcord met, became pals and then came to the attention of G.I.JOE. We also learn the true origins of Cobra’s leaders which adds tremendously to the pay-off reveal at the end of The Rise of Cobra. Initially I had planned to simply pick up the movie novelization, but because I’m familiar with Collin’s work, I was aware that he doesn’t pad anything, his story telling simply smart and complete. For him to have opted to do this prequel meant it was important to the whole and so it is. With the prequel, G.I.JOE – The Rise of Cobra becomes a something more than merely a cartoon movie adaptation. Without it, well, save your pennies for the movie itself.